Tech-nically Homeless: Don't Be "Those Guys"
The van owner was much more thoughtful of his fellow campers than the guy below, his generator must be on an auto-start program because it started up at 1:30am and 3:45am (I checked my smart phone after I got woke up). Two words: solar power! Solar panels have gotten so much more affordable today than even when I installed mine on the roof of the Tank it's hard to understand why more people don't use them when camping. The Tank's solar install. Wish that vent hatch hadn't blown off. 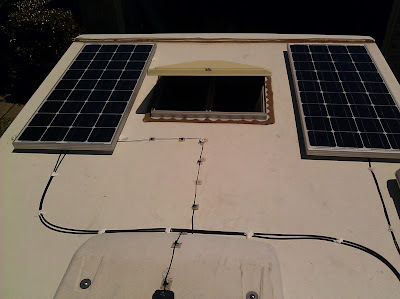 If the reason for not utilizing solar panels was not wanting to permanently install them on the RV in question then the answer is using portable panels like the two panel setups that fold up like a suitcase when not in use. There are even flexible panels now that are like long strips of plastic that roll up when not in use.